Jesus of Nazareth was a Jew living in Judea, yet he didn’t preach in Hebrew, and he may not even have spoken it. Judea was then part of the Roman Empire, yet Jesus didn’t speak Latin either. Of course, Greek played a larger role than Latin in Judea and the empire’s other eastern provinces: the former domain of Alexander the Great and his Hellenistic (“Greek-like”) successors. Yet Jesus didn’t speak Greek either. Nor did he speak Persian, the languages of the Greeks’ predecessors: the first conquerors to unite the Fertile Crescent into a long-lasting empire. So what was Jesus’ language? He spoke Aramaic, and so did most everyone he knew. Aramaic never had a great empire, yet it was the Fertile Crescent’s lingua franca for more than fifteen hundred years. Why? Aramaic may have begun as the language of nomadic herders living within the Fertile Crescent or on its fringes. Starting in the 1000’s B.C.E., these Aramaeans spread across the region (possibly spreading camel domestication at the same time). They conquered several territories, setting up small states like Aram-Damascus in Syria, while in others they just immigrated. Their dispersal probably made their language useful for trade from early on. And learning Aramaic wouldn’t have been too hard for most of the Fertile Crescent’s people. It was a Semitic language — from the family that includes modern Arabic and Hebrew — and so were the region’s key native languages, outside Egypt. Gradually, the Aramaeans blended into the local populations, losing their separate identity. But trade continued to spread their language, particularly during the 700’s B.C.E. It grew so central that the Jews, for instance, retired Hebrew to sacred status, like Latin in Catholic Europe, and spoke Aramaic day-to-day. Empires often spread their own languages, so it’s striking that Aramaic held sway through the Persian, Greek, and Roman empires, which dominated the Fertile Crescent for more than a thousand years, starting in the 500’s B.C.E. No one can explain Aramaic’s success with any certainty, but I’ll offer a theory. Aramaic was a humble tongue, not a political language. It spread primarily because regular people found it useful, not because a powerful kingdom used it for laws and decrees (though the Neo-Assyrians and Persians did encouraged its use). A language that relies on a powerful state may fade away when a conqueror takes over and imposes another language. Etruscan faded away, for instance, when the Romans conquered Italy’s Etruscan cities and imposed Latin — just as Greek departed Turkey when the Ottomans tore down the Byzantine Empire and imposed Turkish. But Aramaic had no prime kingdom to be overthrown. Its humble roots were too widespread to be pulled up so easily. Aramaic finally gave way to Arabic, starting in the 700’s C.E., when the Arabs conquered the Fertile Crescent. I suspect Arabic had two advantages over the region’s past imperial tongues. First, it was a Semitic language, like Aramaic and unlike Persian, Greek, and Latin, which belong to the Indo-European family. So it wasn’t too hard for the locals to learn. Second — and more importantly — the Arabs’ empire transformed Fertile Crescent society far more thoroughly than the Persians, Greeks, or Romans. The earlier empires pretty much let their subjects worship and live as they always had (so long as they paid taxes). The Arabs spread Islam, which brought change deep into the lives of common people: deep enough to alter even their language. Ancient Aramaic has several descendants today (and in fact it began dividing into dialects and separate languages in ancient times). The best-known Syriac, the holy language of many Middle Eastern Christians. But only a few small groups speak these Aramaic languages: most of them Jews and Christians scattered across the Middle East. In a way, though, Aramaic retains a broad influence. A lot of its vocabulary has entered Arabic, and its alphabet was the precursor for both the Hebrew and Arabic alphabets. © 2011, 2015 by David W. Tollen. All rights reserved. Thank you for interesting historical and linguistic information in this article. It would be interesting to know the effect of Aramaic language to other languages such as Persian or Greek. What loan words entered into neighbouring languages.? Thank you, Mehr. Good question. The exchange of loanwords is a normal process, so I’m sure Aramaic did lend words to its neighbors, as well as receive them. But I’m afraid I don’t know which words. 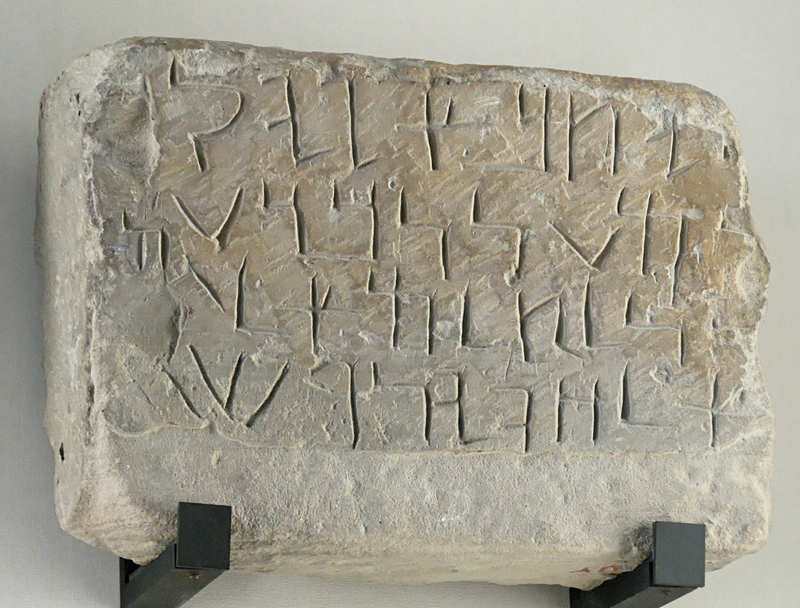 Of course, Aramaic and it’s fellow Semitic languages did lend their whole alphabet to Greek. The Greek alphabet is based on the Semitic languages of the region.